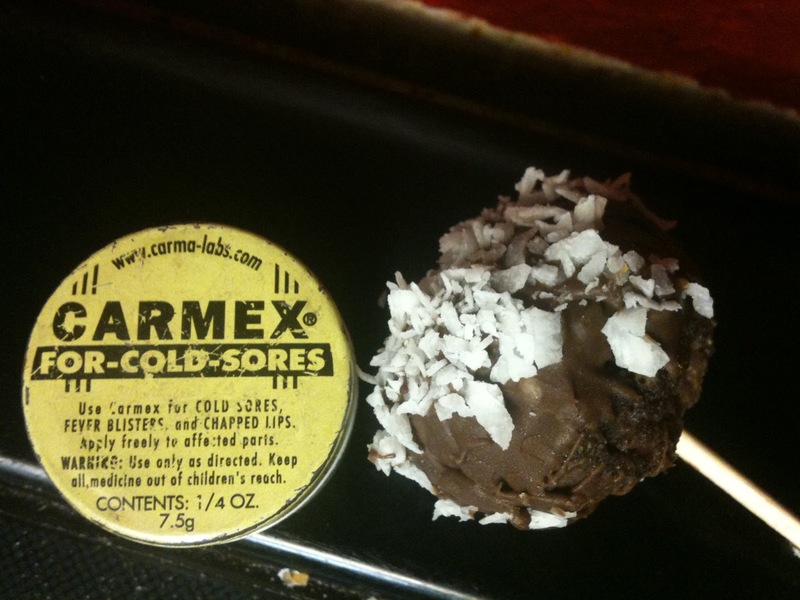 I love the idea of Cake Pops. Especially for birthday parties. No plates or napkins needed to serve the cake! I have seen these at the stores, but have not tried them. I'm not sure I can justify eating something that small, that has that many calories (ranging from 170-180, and 9 grams of fat each). Especially since given the size, I would definitely want to eat another one...or two! I tried my hand at Cake Pops last night (well, I accidentally bought low sugar brownie mix instead, so they would be Brownie Pops) and they came out great! And, they are only about 8 cents a piece to make at home. 1. 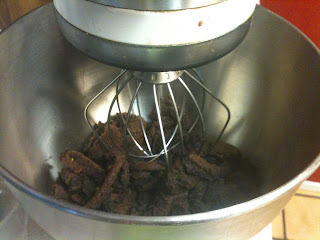 In a mixing bowl combine brownie mix, soda and ground flaxseed. Batter will be very watery. 2. Pour into greased brownie pan. 3.Bake for 20 minutes (or so...check after 15 minutes) Once done, let cool completely. 4. 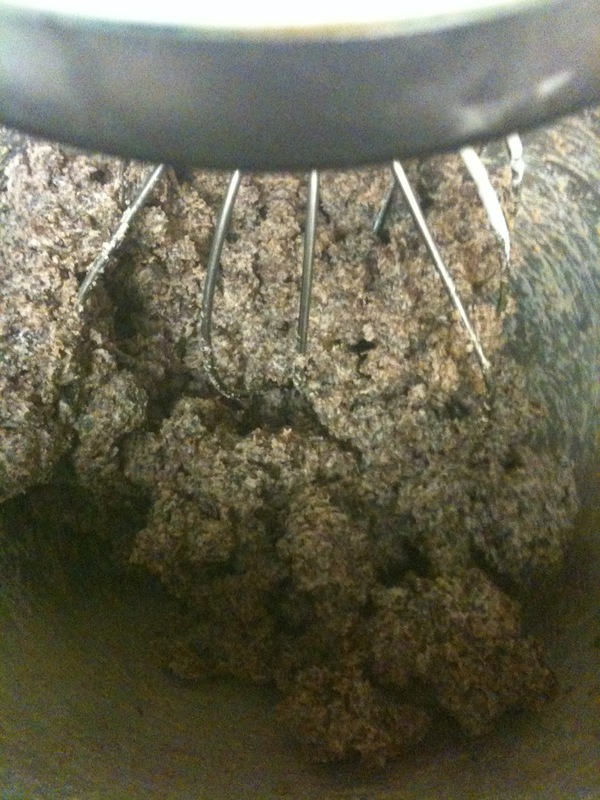 When cooled, crumble into mixer bowl. Brownies are moist, so cooked mixture will still be a little moist. Use whisk attachment (or hand mixer) to continue to crumble mixture. 5. Add 1 tub of yogurt and mix some more. 6. 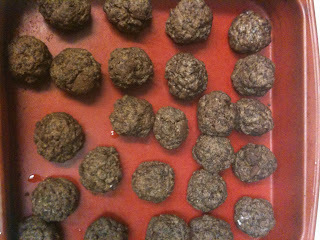 When yogurt is combined, roll heaping tablespoons of mixture into balls. Refrigerate or freeze until balls feel a little more solid. 7. Microwave chocolate coating in 30 second intervals, stirring frequently until chocolate is creamy. 8. Insert sticks into brownie balls, and using the back of a small spoon, smear chocolate coating onto brownie ball. 9. 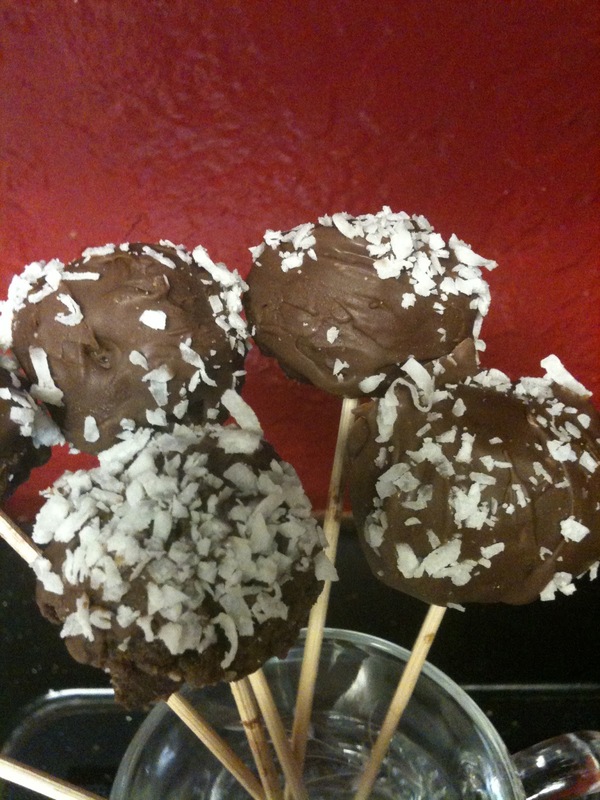 Sprinkle chopped coconut onto chocolate dipped ball. I am not sure how big the Cake Pops normally are, but this recipe made 25 cake pops. They have a little less than 90 calories, 2.5 grams of fat, and 1/2 gram of fiber each. Next time, I am going to use cakemix. I put too much yogurt, which made them slightly gooey. I will use non-fat cream cheese next time. I will try a mixture of semi-sweet chocolate chips and carob chips for the coating next time. I think that will make the coating go further. Yum! Looks awesome! Will try tomorrow! Thanks!